An inspirational three-year-old from Wainfleet who is blind has sent the world ‘dotty’ to help raise money for charity. A massive £1,085 was raised when best friends Leanne Blair and Leesa Higgins held a fundraising Wear Dots Raise Lots day at the local Co-operative Food Store for the RNIB READ charity. The charity was chosen because Leesa’s son, Brodie, was born blind – but it was when the event was posted with the tag #weardots on Instagram by Leanne’s brother, Mark, via the Bearded Villains UK Facebook chat room, that it attracted interest from as far away as France and America. She added: “It was highly emotional and overwhelming. Those who took part in the event at the Co-op were sponsored for wearing dots for the day. There was a cake stall, games and a prize draw thanks to generous donations from businesses in Wainfleet and Skegness. Brodie’s big brother, Connor, was sponsored to have 36 tins of rice pudding poured over his head, raising £200. 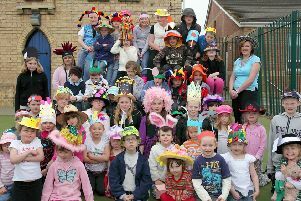 Wainfleet Magdalen School also held a non-uniform day. Leesa said: “I feel it’s important to make donations and support charities that are available to help Brodie.